Britons and Canadian citizens who win prizes big and small will owe nothing to their governments at tax time. You are lucky and Americans are so jealous! US citizens are required to report all prizes, even small wins, as “Other Income” on their income tax return, and the total street value of the prize is considered taxable income. There are a few minor technicalities for Canadians and British giveaway winners that aren’t required of Americans. The prize winner must pass a skill test, often a math question that’s brief and simple enough for a school child to pass with ease. This skill question rule applies to both judged contests and sweepstakes won strictly by chance. 1. According to Canadian law, all sweepstakes must be free to enter. 2. There aren’t as many giveaways offered to Canadians, relative to the US. But that’s okay because the over all the competition is less and the prizes are just as good. 3. Now about the skill-testing thing mentioned above. It is against Canadian law to win a giveaway with 100% pure luck. That’s why the government requires the winner to pass a mathematical skill-testing question. Canadian skill-testing questions are easier than British qualifying questions. 4. Most sweepstakes are void in Québéc because the province has onerous rules that sponsors must follow to legal run a sweepstakes. The sponsors just don’t want to bother complying with so many rules, so they make it easy on themselves and bypass Québéc totally. 1. British competitions are also free to enter. 2. The skill testing question is a technicality that prevents the drawings from being classified as an illegal lottery. Compers need a bit more actual skill than Canadian sweepers to pass the qualifying skill portion, but in reality the questions aren’t very hard. 3. No taxes are owed on wins. 4. The rules in Northern Ireland covering drawings are slightly different than in the rest of the UK. Profit From Sweepstakes details government rules in England, Scotland and Wales. 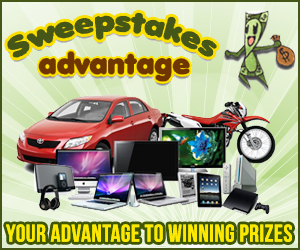 Entering sweepstakes is one of the most popular activities on the internet, and the number of giveaways and ways to win will continue expanding in the future. Want to win more prizes with less effort? You could kick the competition to the floor with my winning tips. Profit From Sweepstakes is longer and more detailed than other books on winning. Get it before the price goes up to $9.95. >> CLICK HERE << for the secrets to winning more giveaways.